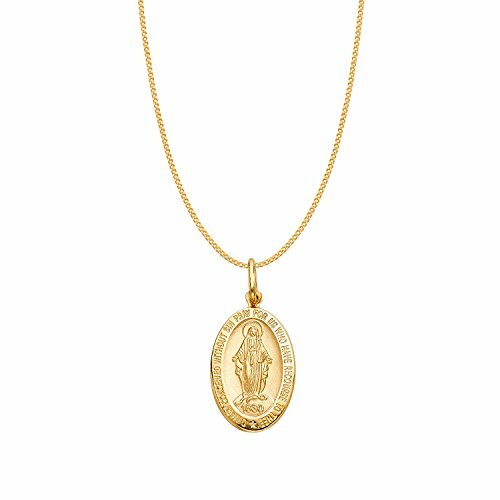 14k Yellow Gold Miraculous Medal Virgin Mary Oval Medal Pendant with 0.90-mm Curb Chain by Precious Stars at Blood of The Young. MPN: PT276-CH274-16. Hurry! Limited time offer. Offer valid only while supplies last. This Miraculous Medal pendant is crafted of 14-karat yellow gold. The oval shape enhances the image of Virgin Mary with her arms outstretched. This Miraculous Medal pendant is crafted of 14-karat yellow gold. The oval shape enhances the image of Virgin Mary with her arms outstretched. Circling the image are the words O Mary Conceived without Sin Pray for Us Who Have Recourse to Thee'. This pendant measures 0.90 inches long. The pendant is completed with a matching 14k yellow gold 0.9-mm curb chain in 16 inches length.